when marion cunningham passed away earlier this summer, the new york times published her famous coffeecake recipe — a truly wonderful recipe (not too sweet, well balanced, comforting like a mother’s hug). i baked it following the recipe to a tee the first time around — loved it! the second time around, i decided that it would go nicely with the sage that i had growing in a pot on my window sill. i used about 6 sage leaves, chopped up and folded into the batter at the very end. next time, i’d probably use double the amount of sage, as the flavour wasn’t quite strong enough. 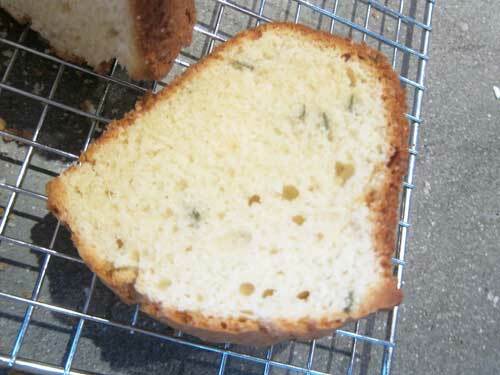 if you haven’t already, do bake marion’s favorite cake (with or without the sage)! This entry was posted in Cakes and tagged baked goods, cake, coffee cake, marion cunningham, muffin, sage, sour cream cake, sour cream sage cake. Bookmark the permalink. You didn’t include where to find the recipe! click on the embedded link in the post!